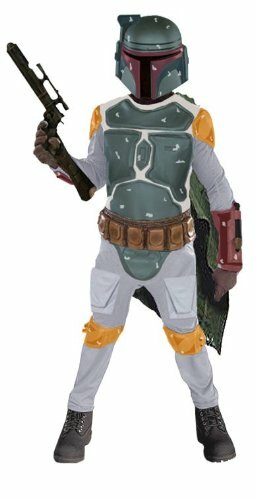 Everyone's favorite bounty hunter makes a great costume for fans of the Star Wars saga. This is a deluxe version of the popular character costume. With this Star Wars costume purchase you'll get a Boba Fett printed jumpsuit with attached cape and shoe covers. You'll also get the bounty hunter's iconic helmet mask. Pick up a Boba Fett blaster to complete the look this Halloween!